Shillong Lajong played their third straight away game on a trot when they faced Churchill Brothers in the Tilak Maidan in Goa today. Churchill came into the game being one of the only two sides not to win a game in the ongoing I-League season. Lajong came into the game on the back of three straight defeats at the hands of East Bengal, Arrows and Gokulam Kerala FC. 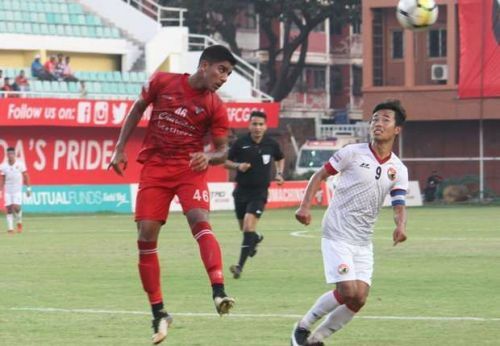 Churchill wanted to get all three points from the game and secure their first win of the season, while Lajong wanted at least a draw from the tie to take a point home at least from their three-game journey. Churchill started the game as the better team and could have taken an early lead through Wills Plaza, but the Trinidad and Tobago striker made a hash of a comfortable situation. Lajong opted to go for a strategy that saw the young boys from Meghalaya test the Churchill keeper from a distance. Wills Plaza finally broke the deadlock in the 18th minute to give Churchill the lead. Lajong skipper Samuel Lalmuanpuia was rewarded for his continuous efforts from a distance when he curled one into the top left corner of the Churchill net to give Shillong the equaliser. The red machines had their lead restored by their skipper Dawda Ceesay in the 38th minute through a Wills Plaza pass. Churchill went into the break with a slender one-goal lead. Lajong came off the blocks quickly in the second half and equalised through Samuel's namesake Samuel Kynshi. After that, it was all Churchill who pressed the accelerator hard scored two goals in the span of three minutes to give Churchill a two-goal lead which they saw through for the rest of the game. Wills Plaza scored a hattrick to derail Lajong's hope of getting at least a point from the game. With this 4-2 victory over Lajong Churchill registered their first win of the season. On that note let us take a look at three reasons why Lajong lost to Churchill. The first two games that Lajong played everyone praised their Centre Back pairing of Aibanbha Dohling and Kenstar Kardong. The centre-back duo was superb against Aizawl and East Bengal. So much so that the lads kept the free-scoring Mexican Enrique Esqueda completely quiet. Today though it was a different tale, with Kenstar injured and not playing Kynsailang Khongsit paired Aibanbha in the heart of the defence. Right from the kick-off, it was evident that the bonding between the two wasn't great as Churchill kept getting past the defence on numerous occasions. Kenstar had a dip in form from the Arrows game, but still, he is Lajong's best Centre Back at present, and his injury really cost the side. Lajong fielded a new Centre Back pairing today against one a team which has one of the best attacks in the league at least on Paper. Aibanbha has been superb until today, and his dip in form hurt Lajong a lot today. He is someone who is known for his physical presence and tackling, but somehow today he couldn't implement his physical presence properly and looked shaky going into the tackle. If one looks at the replay of the fourth goal Churchill scored, then it will be clear that Aibanbha had the chance to tackle Plaza outside the box and maybe even get the ball, but the young lad choose to get into a running race with Plaza instead, and that really cost his side. With Lalrohlua also having a slight dip in performance the defence suffered today, and it is evident from the scoreboard. Had Wills Plaza not missed some four-five sitters than the scoreboard would have been a reflection of a tennis score.